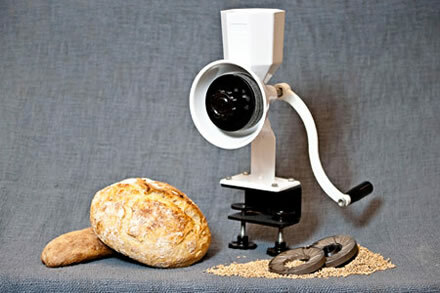 WonderMill Grain Mill - Buy Now! It Is One Thing To Earn The Rating "World's Best Mill"
So what is required to continue being the Worlds #1 Rated Grain Mill? First you have to constantly be working towards perfection. At The WonderMill Company our Mission Statement is "THE BEST CAN ALWAYS BE MADE BETTER." And that is our goal - to always strive be become better. Because of this, in the last 5 years in spite of being Rated #1 we have made over 15 design improvements in our electric mill. One major change was the addition of the #1 Rated Electrical Motor in the World from LG Electronics (see our WonderMill motor article). Since our customers have always demanded quality and longevity, we searched for the best motor company in the World, we found LG Electronics, and we had them design a motor that would give both quality and longevity. We have tested our mill to make sure it is the Quietest, Cleanest, Easiest To Use, Fastest, Coolest, Most Powerful, and the Longest Lasting Mill in the World. We even confirmed this in testing. This testing included milling 1000 pounds (1/2 ton) of wheat non-stop for 10 hours (see video). We challenge any mill on the market to try this, the ones we tested burned up in less than half that time. That speaks to the strength of LG motors (see 1/2 ton endurance video). There is not a better motor than LG Electronics in the World. No other mill company on the market can make this claim. Some don't know where their motor is made or won't tell you (just call and ask them). Nevertheless, The WonderMill Company is proud to partner with the Best Motor Manufacturer in the World - LG Electronics - to power THE BEST ELECTRIC MILL IN THE WORLD, the WonderMill. As our Mission Statement declares "THE BEST CAN ALWAYS BE MADE BETTER." We promise to always be striving to provide you, our customers, with the most durable and most efficient grain mills on the Market. Imagine your favorite recipes made with the great taste of 100% whole grain goodness and all the nutrition from every grain. 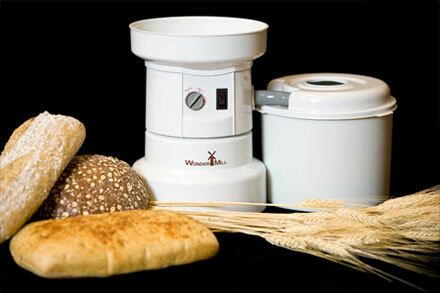 The WonderMill Electric Grain Mill is the quietest and fastest grain mill available. You can create super-fine flour or coarse flour at temperatures that preserve nutrients, ensuring that you will always have the perfect flour for your food. 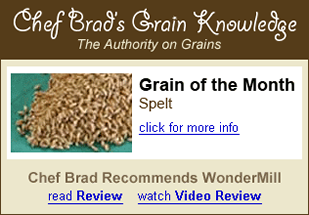 Many of The World's leading grain experts agree that The WonderMill is indeed the one to own. Some of these acclaimed experts include Chef Brad (see his review and video), Anitra Kerr (see her video), Bryanna Clark Grogan - author of 8 published vegan cookbooks and The Vegan Feast quarterly cooking newsletter (see her review), and Julie Hasson - noted food author, cook and executive producer of Everyday Dish TV (see her review). The WonderMill Electric Grain Mill has the capacity to perform big jobs. You can grind over 100 pounds of flour in an hour. You don't have to worry about overloading The WonderMill because of its LARGE 1250 WATT LG ELECTRONICS MOTOR. It is indeed the most powerful micronizing grain mill available. Those who use the WonderMill grain mill for commercial applications (not under warranty) have found the WonderMill to be very durable and long lasting. Donna Poelstra's business uses a WonderMill grain mill to grind 100 to 200 pounds of wheat a week, and she has been using the same grain mill for over 2 years to do it. Many others use the WonderMill to grind fresh whole wheat flour at farmers markets (like Castor River Farm), running large quantities through the grain mill through out the day. Though the WonderMill is not a commercial grain mill it holds up well to the commercial challenge, and it will give you that same reliability in your home. The WonderMill Electric Grain Mill is the only grain mill that has passed the stringent testing required to be certified by UL, CSA, and CE. Some grain mills on the market have not been able to pass any of these. In many countries this is EXTREMELY IMPORTANT. Because in these countries if a customer purchases products without the these certifications the customer assumes all liabilities. You our customers can have peace of mind with these CERTIFICATIONS that you won't have any problems as you use the WonderMill. The WonderMill is also great for making gluten-free flours such as brown rice, white rice, sorghum, quinoa, soy, millet, amaranth, bean, corn, and more gluten-free flours. One of our favorite recipes is Chef Brad's Gluten-Free Rice Bread made with fresh brown rice flour. 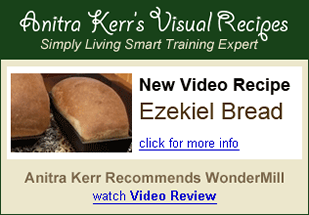 Click here to read more about using your WonderMill for Gluten-Free Flours. At The WonderMill Company we pride ourselves on our customer service. We know that we live in a imperfect world. Although we strive for perfection we know that problems can arise. In that effort we will do everything within our control to resolve any problem. We try to go THE EXTRA MILE and solve problems in a fast and courteous manner. Here are a few of customer comments we have received through the years as we have served them. Many people connect the USA Whispermill to the USA WonderMill grain mill BUT the USA WonderMill SUPERIOR to the USA Whispermill in many ways. Click here for the article we have created to explain these differences. NEW Wonder Junior Deluxe - Buy Now! to Create the Perfect Storm? Professionals of many backgrounds are beginning to see and rave about the quality and affordability of Wonder Junior. The Wonder Junior is especially getting plenty attention in the "prepping world". The Survival Mom (Lisa Bedford) likes that it "is built like a tank" and recommends it as "the hand grain mill of choice". See her review. M. D. Creekmore (author of theSurvivalistBlog.net) gives the Wonder Junior his highest recommendation. See his review. 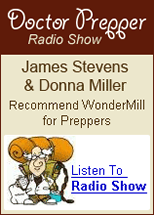 James Stevens (owner of DoctorPrepper.com), writer of the #1 selling Preparedness Guide "Making the Best of Basics" and host of the "Preparedness Radio Network" raves on his show (along with his guest Donna Miller of Miller Grain House) about how great the Wonder Junior is. Listen to the radio show. David Sarti (a well known and un-traditional Prepper Enthusiast) was surprised to see it chew up pebbles during his torture testing of the Wonder Junior on his YouTube channel. With the NEW grain auger we implemented at the beginning of 2011, the Wonder Junior hand grain mill is much more aggressive at getting the job done fast. In a test performed at the WonderMill test kitchen, the Wonder Junior was able to grind 1 ¼ cups of flour in a single minute *80 turns* (see our video speed test). This is 65% (about 1/2 cup) more than we were able to produce with the Country Living grain mill with the same flour setting and the same amount of turns *80 turns*, and for half the price. Even better than motorizing your hand grain mill is our NEW Drill Bit Attachment. Now you can power the Wonder Junior with your high powered drill, available from authorized dealers.